- the time limit for application for permanent residence in the country is now dropped to eight years (down from twelve). - work credit (ensima) are disconnected from the application for permanent residence. - all three-hundred migrant hunger strikers will be allowed to apply for 6-month rolling permits until the reach the 8-year limit in order to gain permanent residence. This is a huge victory on the side of the hunger strikers who now see the road paved for tens of thousands of people to be able to live in the country without the fear of being undocumented. *First and foremost, wed like to draw your attention to the struggle of the 300 migrants who find themselves nearing their 40th day of hunger strike. A truly inspiring story and example of resistance and solidarity. You can read more about their situation on the Solidarity website. *Also in the ongoing and coming up category, there will be a solidarity demonstration for Aris Sirinidis on Thursday evening in Athens. (Follow the link and scroll down a bit to get to the letter from him). 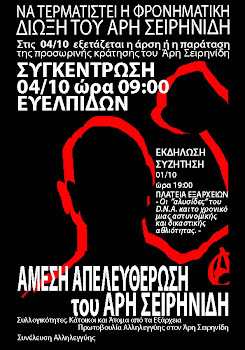 He is just one of many anarchist and anti-authoritarian prisoners of the state in Greece. Tens of thousands of people took to the streets of Athens on the day of the general strike on February 23 and headed to Parliament, flouting police repression and control. In a society crushed daily in the cog-wheels of increasingly intensified repression enforced by the state and the bosses, and under the pretext of the memorandum of co-operation with the IMF, the EU and the ECB, the determination of the thousands to march to Parliament signals a refusal to bow or to fall for the fright that authority wants to give. The demonstration blocks of the anarchists/anti-authoritarians, of the class base unions, of the neighbourhood assemblies, of social resistance against price increases etc. all carried a clear message: the message of collectivisation and self-organisation of social struggles from below, against mediation, party conduct and the class surrender of union bosses. The fighting spirit of the thousands who besieged Parliament and the insistence of those who stayed at Syntagma square for hours, facing the army of police, reveal the conviction that bosses are not unshakeable, that this is the time of social and class strike-back. Almost from the beginning the demonstration came under police attack – the aim being for it to lose in numbers. 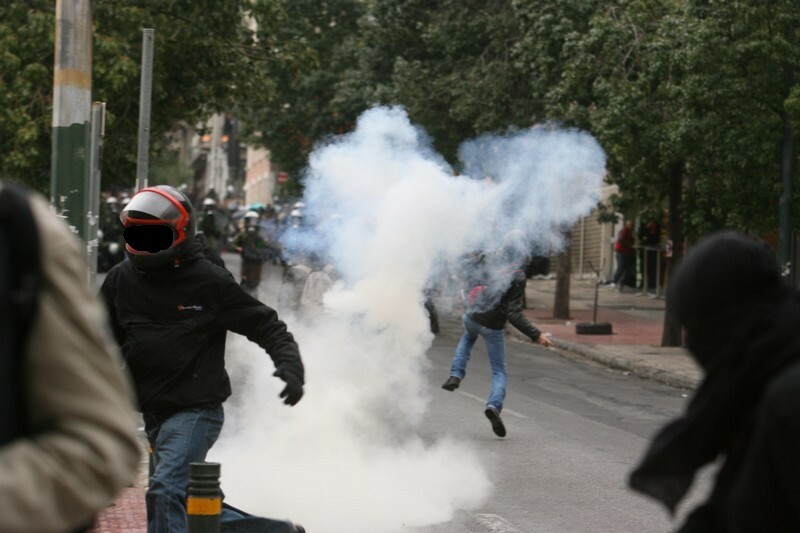 During the arrival of many blocks at Syntagma square these attacks became fierce, with the murderous throwing of tear-gas, asphyxiating gas and stun grenades. The result was for demonstrators to be chased, tens to be injured, detained and arrested in a terrorising attempt aiming at the breaking up of the demo and that would in turn make sure there was no coherent, mass presence of people in front of Parliament. One of the blocks that were attacked and dispersed as soon as they arrived at Syntagma was the block of the Assembly of Resistance and Solidarity of the Kipseli/Patision area. A large part of the demonstrators were violently pushed toward Ermou Street, while some others were encircled by DIAS and DELTA forces and were beaten at Nikis Street by the entrance of the Technical Chamber. This is where comrade Lida Sofianou, who participated in the demonstration with the block of the Assembly of Kipseli/ Patision, was arrested. Policemen of the DELTA force threw her to the street, dragged her toward the finance ministry, and tried to set up a fabrication against her, in order to frame her up her with crushing charges. More specifically they grabbed her bag, which contained texts of the Assembly, and attempted to place within it another bag with molotovs which they themselves were holding.